Earlier today, Walt Disney World Resort President George A. Kalogridis announced some news about one of our most iconic resort hotels – Disney’s Polynesian Resort. 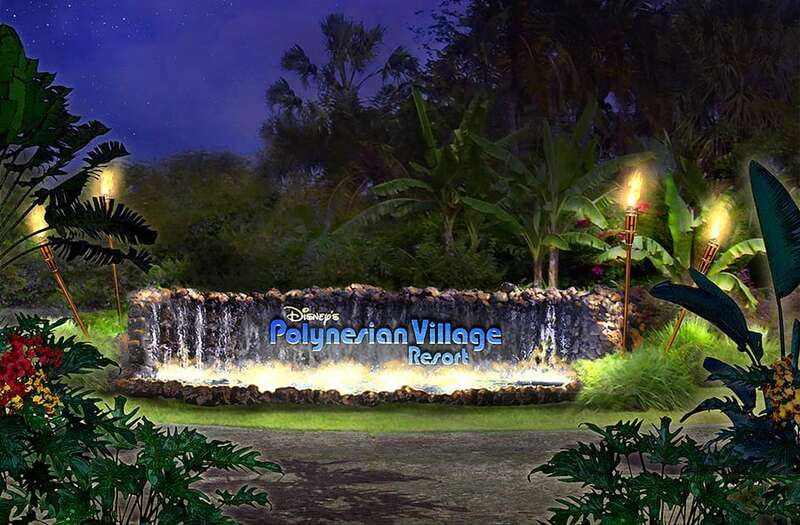 As part of a complete re-imagining, Disney’s Polynesian Resort is returning to its original, 1971 opening day name: Disney’s Polynesian Village Resort. 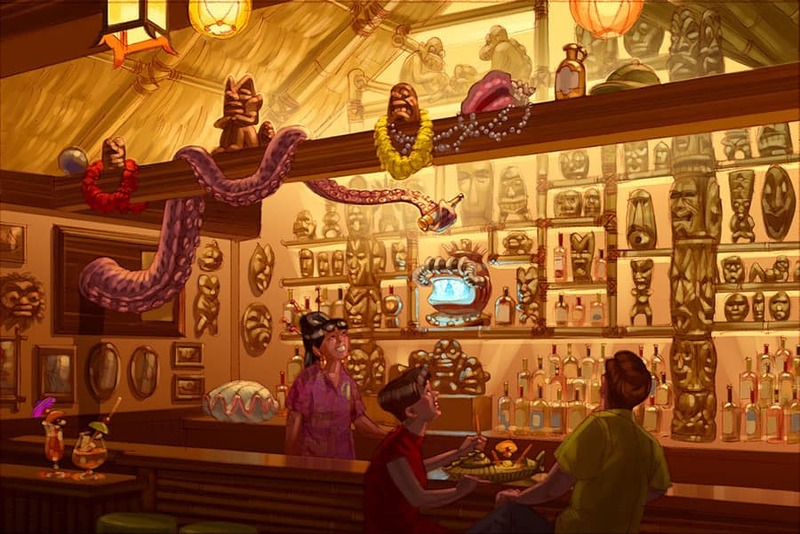 The sweeping renovation, happening now, also includes a new food and beverage experience opening for guests next year, Trader Sam’s Grog Grotto — based on the popular themed lounge at the Disneyland Hotel in Anaheim, Calif. There’s going to be lots more updates on this beachside family favorite, so stay tuned. As you slowly stroll pasted the tiki torches,crossing the bridge gushing water on both sides.. Your listening to the soft music of polynesia, when the doors open to the Great Ceremonial House. You see it, you feel it, your in awe of a two story waterfall surrounded by fauna, peace & tranquility.. The experience can only be described as Majestic..You are magically transported to the islands for which the resort is named, forgetting your place of origin & almost forgetting your own name..It is the first sight of my princess bride on our honeymoon..It is the first sight of a young man bowing on one knee to ask a princess for his hand in marriage..It is where all of my children have played, hulaed and napped. Knowing that my great grandchildren would do the same. Planning my 20th trip to Walt Disney World I reminisce..Standing in the same spot, in awe struck wonder with so many friends, so many family members holding hands with tears streaming down their cheeks & I smiled.. Because I knew Walt was there smiling with me saying… Job Well Done! I can only echo the many many comments posted – I am very sad for the loss of the lobby waterfall. The Polynesian has always represented a home from home for my whole family. I really hope you haven’t taken this away. I brought my friends to Disney World for their first time in February. When we walked into the lobby at the Polynesian, I heard one of the girls say, “Whoa.” I hope the new remodel will elicit the same reaction! The fountain was one of my favorite parts. I loved the sound of the water and the tropical smell. It is what made you feel like you were in a different place than Florida. This is a big mistake! You need a big water feature. This is our favorite out of all the monorail hotels. The water feature in the lobby is part of great memories for my family and so many other families. Please consider keeping it? If not possible to keep in the lobby, something similar outside where we can take photographs? Thank you very much. Please reconsider keeping the lobby’s waterfall, rocks and plants the same. It is so iconic – keep it that way! For those of us who have loved the Polynesian resort since coming as children the 1970s, it’s so comforting to have a touchstone on property that hasn’t changed or been reimagined. We also love the Kona Cafe and have had many great dining experiences over the years, hope that isn’t changing as well. The waterfall/rock lobby has always been “Disney” to me. I don’t know why they would remove such a unique element. Rarely have I read so many comments on any Internet site…just about anywhere…that all uniformly agree. This should send up a red flag. So many people voicing the same opinion. The Disney Parks Blog has done such an amazing job of communicating with the Disney fan base and the Disney customer. Right now we are communicating back. This is an excellent opportunity for you all to listen to that fan base and your customers. That has to be a way of keeping or innovating a way to keep this legendary spot in the Poly lobby. We have faith in you. If anyone can do it…you can. Please save the water feature. The Poly needs updating. But please keep the waterfall. Do not remove the waterfall! It IS the Poly! I really hope Disney will not remove the waterfall and the drawing is only a designer’s perspective that will not come to fruition. The waterfall is gorgeous and one of my favorite spots in the hotel! The lobby waterfall/garden was the single best feature of the resort. Please work it back in during your renovation. Big mistake to remove it completely. This is my first post ever on the Disney Blog, but I had to add my thoughts about this news. Change is good, change is necessary. But there are things imprinted on the heart that should never change. The central garden/waterfall is (to me) the heart of the Polynesian Resort – I feel that changing it will change the atmosphere across the entire resort. 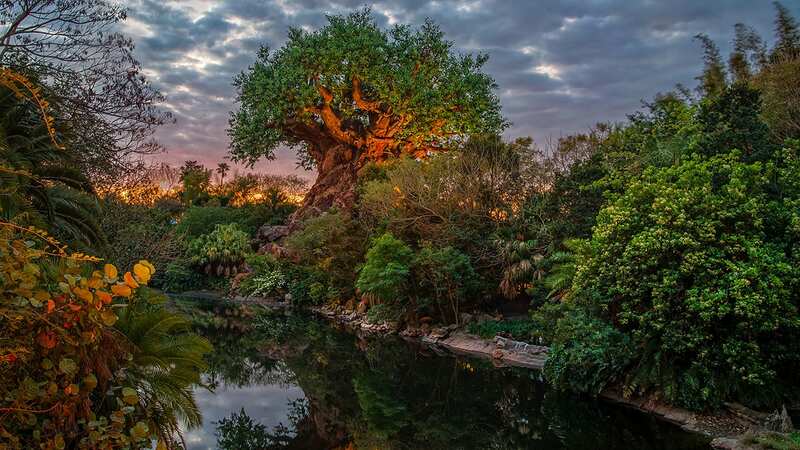 I’m certain that the Imagineers appreciate that and are moving forward carefully – I don’t envy their task ahead of performing open-heart surgery on the Polynesian Resort. In my view, that is what they are about to do and I wish them only the best. I love this resort, I am truly upset that you are taking the beauty of the waterfall away. I always take a picture there of my daughters and I love to see how they have grown up over the years in this iconic family picture. This is a loss, there is no other word for it. This is not a change for the better, I really hope your rethink this choice. I have never wanted to buy into DVC, but I always said if the Poly was an option I would have to reconsider. One of the reasons I feel this way, is because how this resort makes me feel that I am away on a tropical island. The waterfall has a big impact when you walk into the lobby, it just will not be the same without it. This looks great, except, as many others have said, the loss of the central water feature in the lobby. I’ve loved that since I was a young child, and I’m 43 today. I introduced my (now) wife to WDW a few years ago, and she loved the Polynesian on first site – and specifically loved the waterfall in the lobby. Even if we don’t stay there we often visit Kona Cafe and we’ll spent time in the lobby, just relaxing with the water. It is very ‘zen’. I’ll be very sorry to see it go. Attention re imagineers! Channel your inner Walt and create a lobby bursting with life! The waterfall and garden needs to stay as well as the gorgeous gardens that exist on either side of walkway before entry….. I will miss the sweet little ducklings swimming around in those beautiful areas. This re do has to compete with what is already a practically perfect in every way lobby. I don’t often comment on these posts but this was one I HAD to. The original waterfall and central lobby area are spectacular — once seen, you never forget it. I can’t imagine anyone thinking that about this new design. The “old” lobby instantly transported you to Polynesia. This one says “just another hotel lobby”. Pleasant … but nothing remarkable – or particularly memorable. We’re so used to (and have come to expect) big, over-the-top experiences from Disney Imagineers. The current lobby is just that. The new lobby – not so much. I know I’m just adding to what everyone else has said, but please, please don’t take the water feature/garden from the center of the Poly. Someone else mentioned the smell and the sound. Nothing tells me that I’m “home” like that smell and sound. It is what I remember from the first time when I was four and has been a constant through all of the other changes at the hotel. I know that we all learn to live with the new changes and grow to love them, but like for me the change from the original Magic Kingdom hub, some of them always leave me saddened every time I walk by them, as if I’ve lost a good friend. The waterfall/garden at the Poly was always the thing that told me you were at some place special — unique from all the other Disney hotels. Another vote here for keeping the atrium garden/waterfalls. The Poly wouldn’t be the same without it. Love the Trader Sam’s in California..hope the one in Florida will be larger. 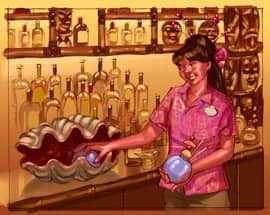 Love the name, love the concept for Trader Sam’s, very disappointed with the removal of the “heart” of the Polynesian. Please rethink removing the waterfall! The waterfall (and smell of the lobby) are my favorite parts of all of WDW. Forty years ago in November 1974 we spent our Honeymoon at the Polynesian Village and the first beautiful thing we saw on our arrival was the gorgeous waterfall! We return each year to see this icon of the Poly that has so much meaning to us. I hope Disney will listen to their guests and leave the waterfall as is. Please do not remove the waterfall and garden! It is iconic and part of the immersive experience of staying at the Poly. I think the new artist’s rendering looks great – open and airy just like Hawaii. The picture does show a water fountain feature. I love the ceiling! I trust the imagineers will see the feedback here and incorporate a waterfall feature in some way. Remember, New Fantasyland looked quite different in the original concept. I’d like to echo others sentiments around the loss of the waterfall. I’d love to see it refurbished but hate to see it shrunk so drastically in size and scope. Please do not remove the waterfall. Please listen to the fan!! Please reconsider removing the waterfall! I have vivid memories of it from my childhood and now my own children have come to love it. It is so unique and welcoming, it really transports us when we arrive in the lobby. We are excited about all of the other changes coming soon to the Poly, but cannot imagine the lobby without it’s signature iconic feature. Revamp the waterfall, yes, but please do not remove it!!! I’m incredibly sad that the waterfall and garden is going away. My grandparents loved it, it was a source of awe for me when I was a little kid and I love bringing my 4 year old niece and nephew there. They find it amazing that there’s this big garden and waterfall INSIDE of a hotel. There’s 4 generations in my family of loving that garden. Taking the waterfall away is like taking the Monorail out of the Contemporary. It is iconic. Please reimagine this. I am divided. Although I love the fact the Polynesian Resort is getting the attention it deserves, there are elements that both wow me and worry me. I love the addition of Trader Sam’s Grotto. 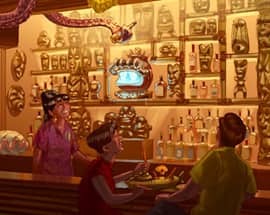 True, it won’t be an exact replica of the Bar at DLR, but it will be a welcome addition to the portfolio of dining at the resort. The more ‘family friendly nature’ of it is really a given, noting the nature of guests at WDW. The new lobby, in many respects, also impresses me, but I do lament the loss of the central water feature. 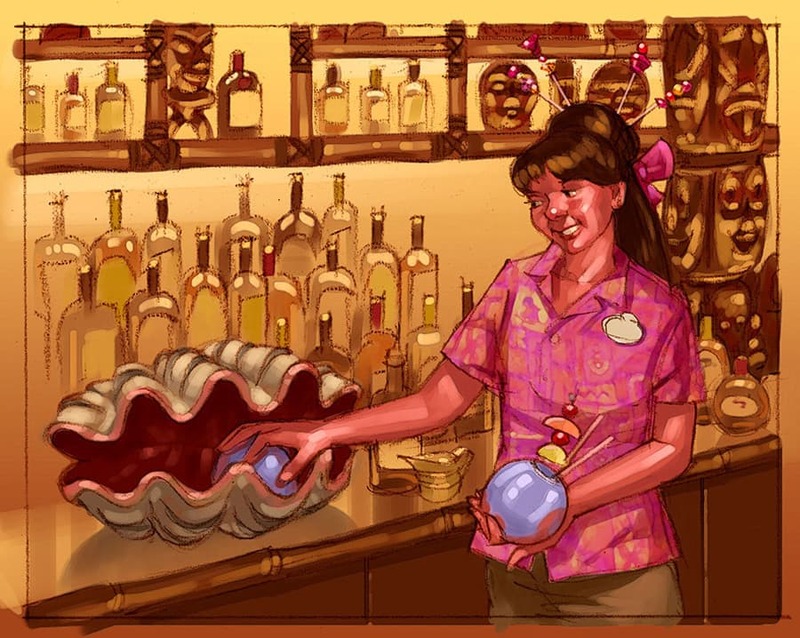 I am sure there would be a way of integrating the new with the old and simply updating the feature to retain the resorts ambience, much of which came from the waterfall. Please, Disney, listen to your guests – is it really necessary to remove such a beloved feature? So from the picture of the soon to be lobby, isn’t that a water feature right in the middle of picture..? Where the tiki man is it looks like a waterfall. Of course I don’t have my glasses on, but it looks to be a small scale waterfall. Truly am excited to see some changes to Poly, but please, please, please do not take out the waterfall 🙁 You have some of the most talented people in the world working for you…can they please do a “work-around” or at least keep some sort of waterfall feature? It truly makes you feel like you are entering “a whole new world”…please reconsider. I am going in two weeks and made reservations at Kona (I can’t afford to actually stay at the Polynesian–but so glad I can dine there!) just so I can show my boyfriend the beautiful lobby! I hope so much that they haven’t started renovating it by then! That hotel’s charm is its retro decor and the way it looks like it came out of someone’s dreams. It’s not like any other hotel I’ve seen. I hope they don’t sterilize it too much. Hey, if I had my way, the water feature and lobby would stay exactly the same. Having said that, the Poly has undergone many changes over the years and people still love it. The new bungalows don’t bother me one bit. None of the changes will diminish my love for the Polynesian. If the staff stays amazing (and they will) and the vibe is still relaxing and calm…..it is still the only resort I want to visit. So if people actually read these comments, please leave the water feature alone. If you can’t, make sure there is something similar. The greenery and sound of the water is so relaxing. Good luck on the renovations and God bless. Save the waterfall! Although I’ve never stayed at the Poly, we ALWAYS love to tour the property, including the wonderful waterfall in the Grand Ceremonial House. Please do not remove this wonderful feature! I love the idea of returning to the original name, and look forward to visiting when the new attractions open. Another vote: Please do not remove the waterfall/garden. Please do not remove the waterfall. We spend a lot of time just relaxing by the waterfall after a long day in the parks or just to be there anytime! This is a very sad day for my family. Every year, for 42 years, we have shown our DisneySide by taking a family photo in front of that waterfall. 4 generations of us in all.